Cut vegetables, paneer, and pineapple to specified sizes. In a mini food processor, combine garlic cloves and 1/4 cup olive oil. Pulse until garlic is finely chopped. Rub garlic and oil mixture on vegetables and pineapple. Now, assemble all other spices to create a marinade for the paneer. Combine cumin powder, salt, black pepper, coriander powder and curry powder in a bowl and mix. Then, rub the spice blend onto the paneer. Brush hot grill with the remaining 1/4 cup of the olive oil. Place vegetables, pineapple and paneer on the grill. Cook until al dente with grill marks. Should take 2 to 3 minutes to cook on each side. Remove from grill. Cut toppings into cubed pieces. 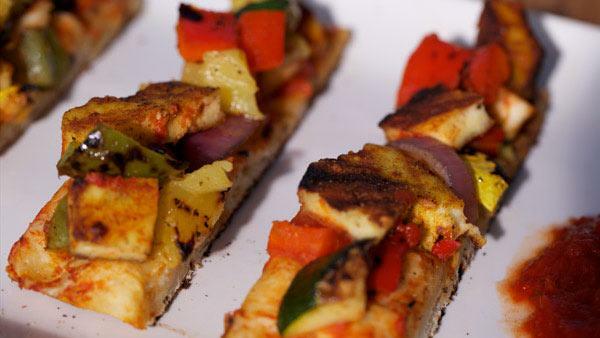 Layer pizza dough with marinara sauce, then vegetables, paneer and pineapple. Cook on the grill for approximately 10 minutes or until the crust is crisp and dough is cooked. Note: Make sure to cover the grill with the lid. Cut pizza into strips, three strips per appetizer portion. Plate pizza bites in the center. Garnish platter with a dollop of the remaining marinara sauce on both ends.